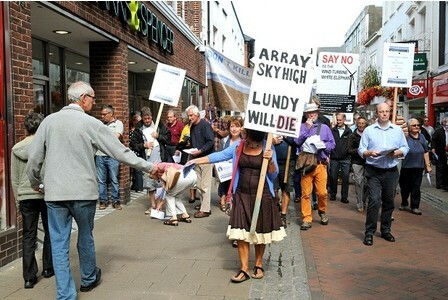 More than 100 residents opposed to the proposed Atlantic Array development have marched through the streets of Barnstaple. 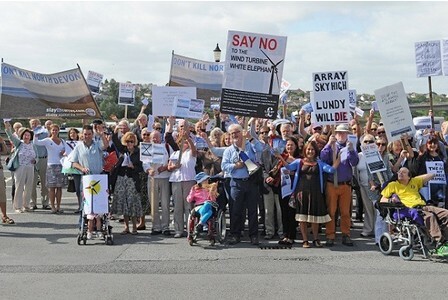 However, a public meeting which followed was marred by a heated confrontation between a former UKIP councillor and a supporter of the array project. The incident saw UKIP’s Mike Pagram verbally confront the supporter, following a number of interruptions during the meeting, before the man was ejected from the event. The meeting was organised in a bid to raise awareness about the end of the public consultation period for the Atlantic Array development on Monday, September 16. 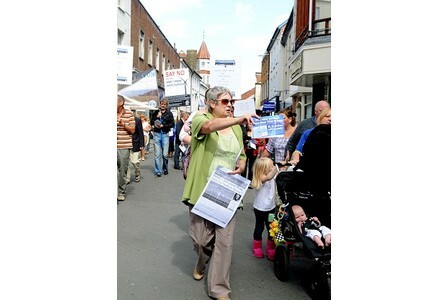 The morning’s parade saw members of the Slay the Array opposition group march through Barnstaple High Street, handing out leaflets giving advice on how to register their interest in the consultation. Protesters in the High st. Despite the interruption, the public meeting at the Park Hotel saw leaders of the campaign put across their case for opposing the plans. 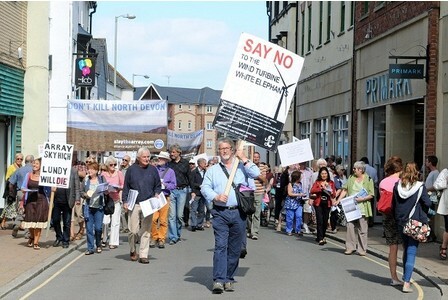 Group spokesman Steve Crowther said: “The aim of today was to increase awareness in North Devon of this plan that’s on the table, which will reach a critical point in two week’s time. “My objections focus on one thing in particular. Not there. North Devon Conservative candidate Peter Heaton-Jones, who announced he was to join the campaign last week, told the crowds to maintain their opposition. He said: “This is about the Atlantic Array being the wrong plan in the wrong place. “This isn’t a massive movement against renewable energy. This is about us being sure that this is the wrong plan. Torridge district councillor Jane Whittaker said that events like this were vital in raising the public’s awareness of the project. She said: “I would just like to be sure that everybody understands what is ahead of them. I just worry that so many people don’t truly understand the implications of this project. During the meeting a man was treated by paramedics.